Technology seems to evolve at light speed these days. I remember playing sports outside as a child. Now you can play golf, baseball, tennis and even race cars in the comfort of your own living room! Wild how fast things change isn’t it? For a long time I shot photos with a 35mm SLR Nikon. I adore working in a dark room. There is something really special about it. For me it was where the magic happened. Knowing how to use the chemicals, proper exposure timing, and all the various elements associated with creating a well-developed photograph requires the hand of an artist. Needless to say, I was sad to see things shift into digital mode. This past Christmas my husband bought me a Nikon D90 to help me get started as a digital photographer. The camera takes stunning photos. I can view the pictures I have taken immediately and make adjustments to exposure, shutter speed, etc. as needed; I don’t have to develop film so it saves a ton of money; I can edit and manipulate the photos on both my camera and my computer; there are countless upsides I could tell you about digital photography. So, I’m definitely onboard with the digital photography movement. There will always be a tiny part of the artist inside of me that misses the hands-on, analog approach though. My reason for telling you that is to illustrate how tools are changing at the hand of technology. I’m interested to see how fashion illustration by hand will do against it’s digital opponent, CAD (Computer Aided Design/Drafting). I’ve taken a CAD class and believe the software is an incredible tool. I was working with it in the context of Interior Design. The tool is excellent for creating blueprints and formulating exact measurements. I can’t say I’m happy to see it in fashion though. 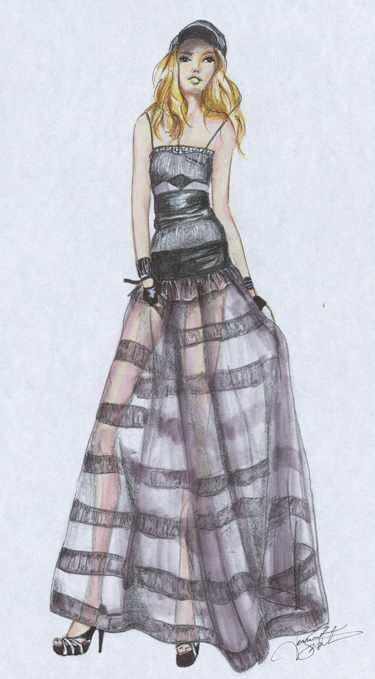 I have seen so many beautiful fashion sketches that are hand-drawn and hand-painted. They’re works of art. I much prefer them to their digital counterparts. 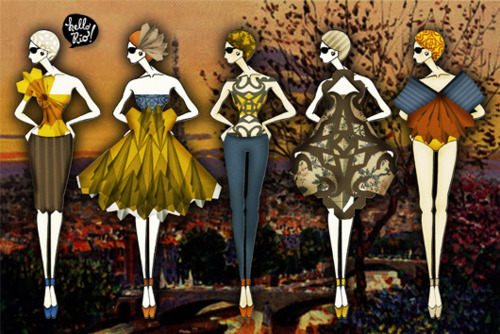 This fashion illustration was created using a CAD program. This is an elaborate rendering of a fashion illustration. Most fashion sketches you see are nearly always devoid of any background. This is because it can take away from the focal point, which is of course the clothing design. The lines are unnaturally crisp and the shading is also immaculate. The benefits to using CAD are undeniable, however. A designer can create scale on their pieces, as well as denote dimensions for things like sleeves and hem. Many CAD programs are equipped with virtual models that allow the garment to be viewed on a human form and the designer can then play with things like textiles and color for the clothing. It is a phenomenal tool for mass production. I’ll leave it at that. This is a hand-drawn fashion illustration. Holy crap, right? The difference is night and day. It’s pretty incredible what a human hand can create. I feel that the shading and coloring in this photo create a much more natural and realistic representation of what this garment would look like in real life. With this type of illustration it is normal for fabric samples to accompany the concept when it is presented to a client. This means you get to see the fabric finish, feel the texture, and play with the way it moves prior to producing anything out of it. A computer can create some great stuff, but nothing gives you a better understanding of the materials than seeing the way a sample moves and behaves under a needle. Some of the top fashion houses were birthed from the hand-illustration skills of the most fantastic designers in the industry. High fashion is art and so are the analog methods that produce it. I will take an unwavering stance on the utilization of hand-illustration to create fashion concepts. Which way will you vote? This entry was posted on Friday, May 13th, 2011 at 12:02 AM	and tagged with fashion design, fashion drawing, fashion illustration, fashion sketching and posted in Fashion Design. You can follow any responses to this entry through the RSS 2.0 feed.